First things first: I’m a bit of an animal lover, and I have been since I was a child. For some reason, I’ve always felt a very strong affinity towards animals, despite only ever having had cats in my personal life (yes, I’m aware of their sometimes less-than-savory reputations). I’ve just always loved animals—cats, dogs, my one pet goldfish that I killed in about four days (RIP), sloths, panda bears, manatees, walruses, and more all have a place at my imaginary ideal dinner party. So you can imagine the difficulty I have experienced throughout life when I confess to you another major part of my psychological makeup: I’m obsessed with wearing fur. I love wearing fur—vests, hats, coats, jackets, bags, everything. I love the way they feel, of course—the softness of the bristles under my fingers—but I also love how I feel when I wear them. A good fur coat is like a piece of armor, something that protects me from the cruel outside world, builds me up into something bigger (and, let’s be honest, better) than I actually am, and generally helps me to feel fabulous. Nothing is more fabulous than a fur coat. As an ardent lover of animals and an equally ardent lover of wearing furs, you can imagine my peculiar predicament. Luckily, I also like to think of myself as a person who feels moved to action by the things I learn, so when I saw some extremely graphic clips of how fur is gathered from live animals, I was so viscerally repelled and disturbed that I vowed to make sure the fur I buy is 100 percent faux. Luckily for me (and the more than 50 million animals killed for their fur per year) there are tons of super-stylish faux fur options out there. And the synthetic process used to create faux fur just keeps getting better and better—so much so that it has become crucial to follow certain guidelines to make sure you are actually buying faux fur when you think you are. Some coats, vests, and jackets labeled as faux , sadly, aren’t always 100 percent synthetic, so you have to be cautious. So yes, I’m one of those fashion people who loves animals and thusly is anti-fur. No, I’m not going to go around to runway shows throwing red paint or flour on innocent bystanders, nor do I judge people who choose to wear fur. I think every woman is in charge of her own life and her own wardrobe, and far be it from me to judge. After all, I still wear leathers and other animal skins, so in full candor, I’m not 100 percent vegan when it comes to my fashion choices. But there’s something about fur in particular that repels me as an animal lover—probably because, deep inside, I love wearing it so much. With the goal in mind of maintaining both my instinctual love of animals and my sartorial love of furs, I perused the web and came up with 13 stylish faux fur pieces you can shop for this season. Another fun fact about faux? It’s significantly more affordable than the real deal. 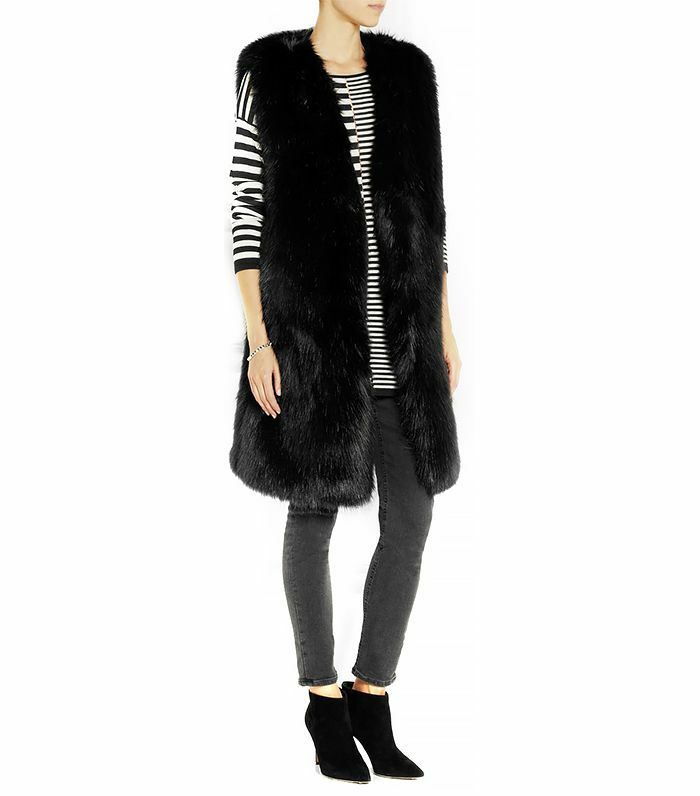 Keep scrolling to shop 13 stylish faux fur pieces for the fall season! What do YOU think about real vs. faux fur? Tell us in the comments below!